Mack leads a presentation for cadets. Leadership is one of the many skills developed in CAP, according to Mack. Civil Air Patrol may be called America’s best-kept secret, but students in its cadet program are about ready to shout about it. Civil Air Patrol (CAP) is an auxiliary of the U.S. Air Force and is said to only be heard of when a plane goes down. 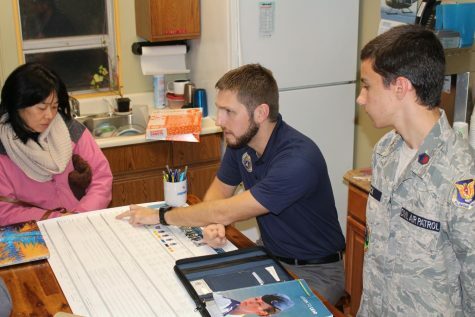 CAP is tasked with disaster relief and inland search and rescue missions, and its cadet program for teens focuses on leadership, aerospace, fitness, and especially character education. Nathan Dupee, freshman, leads cadets in marching drill. Physical education is placed at high value, according to Dupee. Mack joined Civil Air Patrol on the recommendation of a family friend, and a pilot himself, who recognized Mack’s passion for aviation. Mack has earned the rank of Cadet Master Sergeant and Culu Flight Sergeant in the year that he has been in the program. Since then, he has already seen a difference. 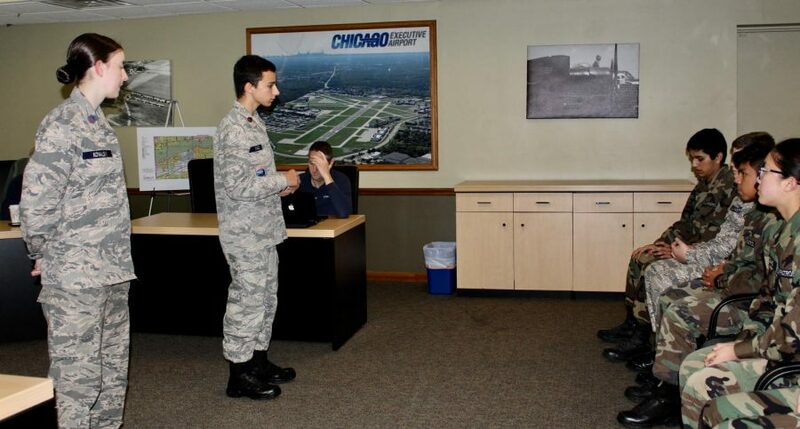 Jake Mack, freshman, and Second Lieutenant Bret Potter, deputy commander of cadets, give an overview of Civil Air Patrol to a family interested in the cadet program. Potter says he enjoys working with young cadets and having a way to “give back” to the program he was a part of when he was their age. 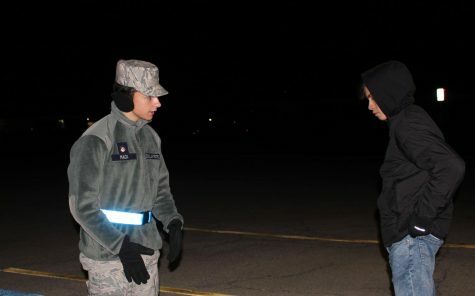 Second Lieutenant Bret Potter, deputy commander for cadets like Mack in the Palwaukee Civil Air Patrol squadron, was a student in the program in his youth and recognizes similar advantages to cadets getting involved at a young age. Mack is not the only student who has taken advantage of the program’s various opportunities. 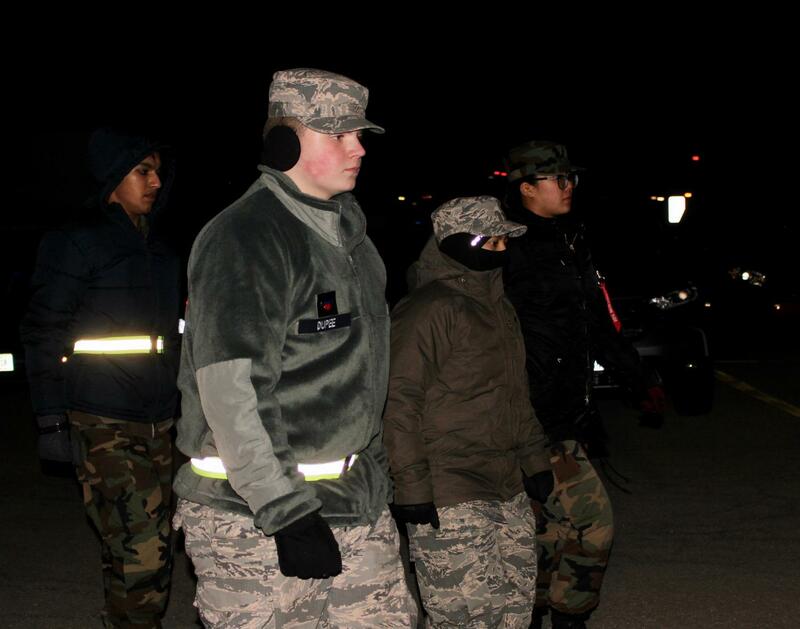 Nathan Dupee, freshman and cadet, is an Airman First Class in Civil Air Patrol. Dupee learned about the program through Mack and joined the same squadron out of interest in aeronautics and piloting. Both Dupee and Mack have aspirations to become pilots, and Dupee even plans to stay with Civil Air Patrol as a lifelong commitment. He says he hopes to someday “actually save people with emergency rescue and services,” and to be an influence on the country as well as individuals.